Her hand-lettering, dabbling in typeface design, with a fandom of Ru Paul, piqued my interest in Bella Schilling and her letterform-driven work. Here, she shares her attitude and practice of every day being national writing day. 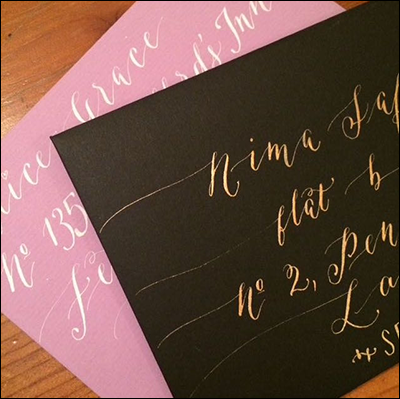 How did you arrive at what you do as a calligrapher and designer? Was there an initial encounter of lettering/design/typography that played a role in your path toward becoming a typeface designer? I studied Visual Communication at AUB [Arts University Bournemouth] which was a mix of graphic design and illustration. Back then, my work was heavily illustrative, but it wasn’t until my final year where I got accidentally obsessed with calligraphy. My classmate and fellow type nerd, George, had a copy of “Calligraphy in the Copperplate Style” by Herb Kaufman and Geri Homelsky, and he let me borrow it, which was a bit of a mistake on his part, since I never really intended on returning it. I spent all my time after class, and time during class, going through reams of graph paper, practicing Copperplate and Blackletter. Calligraphy and lettering became an escape for me, but I didn’t think it would lead anywhere. However, at the end of year show at the D&AD [Design and Art Direction] awards, I met my tutor’s best friend, Tom Foley, Type Developer at Dalton Maag, who looked through my lettering sketchbooks and advised me to move to London and apply for a Type Development internship at Dalton Maag. So I did. Just making sure I kept practicing all the time and honing my skill set. I ensured that I remained focused on my goal, and continued to push myself even when I didn’t feel like it sometimes. 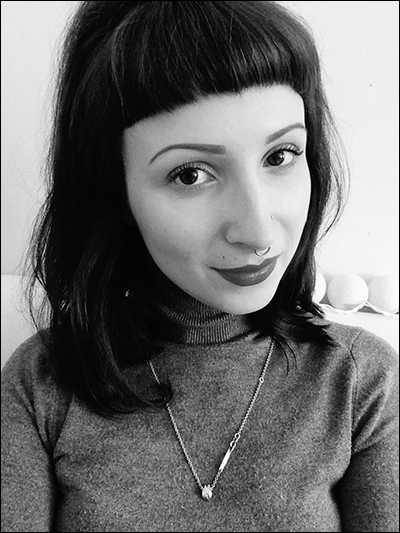 For the first few years living in London, I had to balance working a full-time day job with freelancing, as well as working on my typeface and other personal projects. 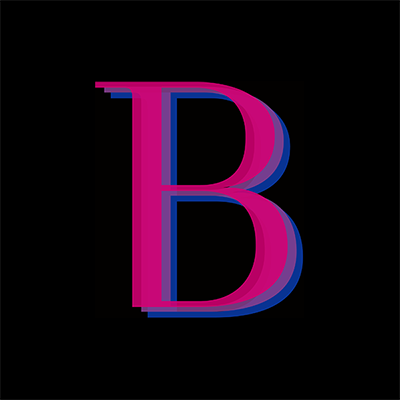 I reached out to Victoria Rushton for some advice on getting my foot through the door, and she introduced me to the wonderful Alphabettes network, for which I am ever-grateful. 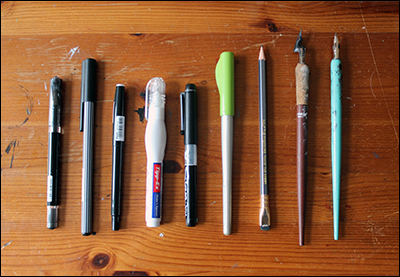 How do you keep up with your lettering discipline? Do you have a lettering regiment? I wouldn’t say that I have a regiment per se, but I did take part in 36 Days of Type for the first time this year which was so much fun! I didn’t plan how I wanted to do it—I just wanted to see what I would come up with on a day-to-day basis. 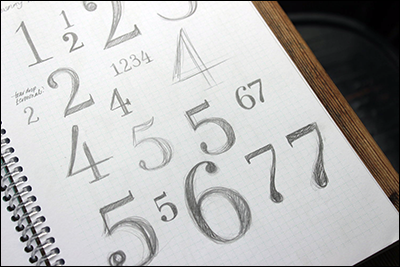 Towards the end, from the letters to the numbers, you can see that I figured out a distinctive style. But it was so exciting to develop new type design ideas I had wanted to experiment with, and 36 Days was a good excuse for that. Do you also practice writing and mailing personal correspondence? Easy to make this assumption. Feeling you make more handwritten messages than emails. If not, surely derive pleasure from pen and ink than keyboard and pixels. Yes I absolutely do! Where clients and projects are concerned, everything is discussed via email, of course. But my best friends and I write to each other on a regular basis. They are both teachers (Alice in London and Anna in Paris), and they share my love for stationery and handwriting. I’ve found that it’s a very cathartic activity, but it’s also so much fun picking out various papers and inks, and adorning them with decorative stamps, tapes and so on. Highly recommend! a coping mechanism in these turbulent times? Typography has always been a problem-solver, and it’s there to serve a purpose—from being able to navigate your way around the airport, sending a text…the list is endless. But it’s also a great tool for expression of thought and protest. One example that comes to mind is the signage that was used for the Women’s March—several ’Bettes used their fierce lettering skills to make some great signage. Another example is Resistenza’s (Giuseppe Salerno and Paco González) “Love Wins” font, which is a collection of hand-lettered phrases designed to celebrate diversity and spread the love. It’s free to download, and you can use it to create signs and banners for the Pride celebration (or any other day of the year). (ace name) typeface? What was the process in getting it real? I created Dita Display during an extended internship at Dalton Maag. I had no experience in type design whatsoever when I started, and I began by sketching these Bodoni/Didone-inspired letterforms. I made a display face without even realising it, since it’s super high-contrast and has asymmetrical serifs. Working closely with Ron Carpenter, I then went on to develop text, italic and bold weights. A couple of years later when I began learning Russian, I designed a Cyrillic weight too, with Krista’s (my mentor’s) expertise. Dita isn’t available to buy, because it was such a steep learning curve, and, knowing what I know, there are a lot of design decisions I wouldn’t make now. But I do have another typeface I’m slowly working on that is very different to Dita, and I’m excited about it! 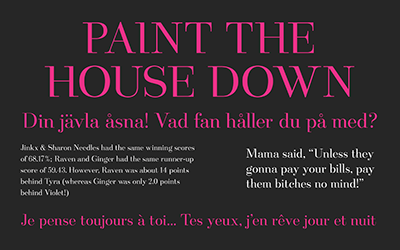 (Fun fact: I called my typeface after Dita Von Teese, in case you didn’t guess already. I’ve admired her since I was about 14 years old). 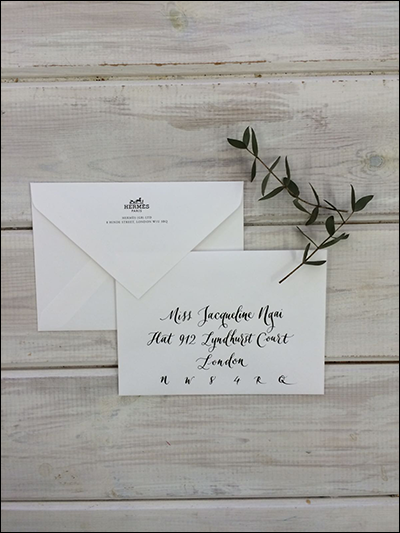 As of about two months ago, I am now a contracted freelance designer and calligrapher for Lamplighter London (founded by Chiara Perano) which is a lovely boutique design and calligraphy studio. Chiara has a mad VIP client list (such as Mulberry and Nike), and a couple of weeks ago she asked me if I wanted to write the invitations and envelopes for Hermès’ Autumn/Winter Womens’ Wear Collection. I would have been a fool to have said no! It was an intense two days—I was super nervous not to make too many mistakes, and my calligraphy had to be meticulous (letterforms as on point as possible, all writing had to be completely central, with an equal amount of spacing between lines and words), and everything had to be completed by the end of the next day. I think they came out pretty well, though, and Chiara and the client were pleased, so that’s all I could have hoped for. the quality of work you want to do? At home, I have a small desk next to the window in the living room. It’s a little cosy but I manage to work efficiently. 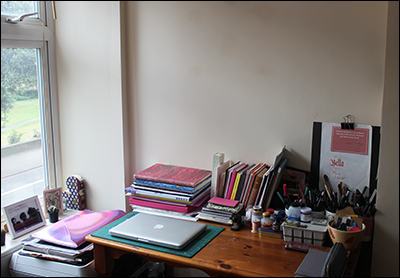 I am a bit of a neat freak and it certainly helps my workflow to be organised. At the Lamplighter studio, there’s lots of great working space—it’s really light and I have access to lots of other materials, and Chiara’s advice/critique of course. My vision of satisfaction is to have enough good, exciting work to keep me going, both financially and creatively speaking. I’d love to work on more high-profile clients, take part in more collaborations, and continue to learn new skills and meet new people. I’d love to have my own studio one day, or a creative partnership. All that being said, it’s really important for me to take time out and go travelling. I love London, but it is very exhausting at times, and I feel as though I need to take time out and re-charge when I can afford to do so. Who and/or what keep(s) you going? My amazing partner, who is so encouraging and continues to push me to be better, as do my wonderful friends. I’m also very lucky to come from a family of artists, so creativity has always been a huge deal. Being part of the Alphabettes community is invaluable—I have my mentor, Krista Radoeva, as well as a huge network of other brilliant and supportive women, who are always willing and able to provide technical and emotional advice. And I also have this huge driving force within me, that I often forget is there, because it’s wrapped around anxiety and self-doubt, because I can’t and won’t do anything else. makes it special for startups/business/creative community? I think it’s funny that London gets compartmentalised—despite being the same city, people identify with being East, South or West etc, whereas I think the whole of London is special when it comes to being a creative—it’s full of amazing, supportive people. When it comes to South specifically, I think there’s a tight community of people who are all trying to do similar things creatively. Often they understand that you have the same worries and stresses that you do, so they help you however they can. Being a fan of RuPaul, do you have a favorite animated GIF? Haha! Hmm, that’s a tough one. It’s hard to pick a favourite. I think maybe this one where Ru is in hysterics whilst being roasted by Coco Montrese. I think it epitomises who Ru is; she never takes herself too seriously and…if you can’t laugh at yourself, how in the hell you gonna laugh at somebody else, right?! Majority of images courtesy of Bella Schilling. Explore too my Designer’s Quest(ionnaire) series interviews with Type and Graphic Designer Krista Radoeva and Type Designer Victoria Rushton, plus Side Projects series interview with Amy Papaelias, who co-founded Alphabettes.org, a network and blog championing the work of women in type design, typography and lettering.